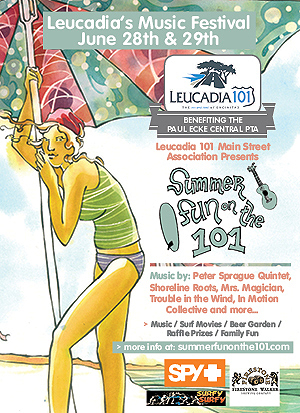 Summer Fun on the 101 officially started May 18th with Battle of the Bands and will continue rocking through Leucadia on June 28th and 29th. Click the schedule for a sneak peak at our very exciting lineup and schedule of events for 2013 (clicky clicky). We love this poster art by Harry Daily and owe a huge thank you to the Spy Optic Art Team for putting it all together. If you’ve never been introduced to some the bands on our schedule, like/subscribe to our facebook page to catch exclusive web features on the artists and businesses that will make Summer Fun happen this year. Music, video, interviews and more! Tons of updates and details on their way. Another fine Leucadia 101 Main Street Association event run in conjunction with Ruthlesshippies.org.